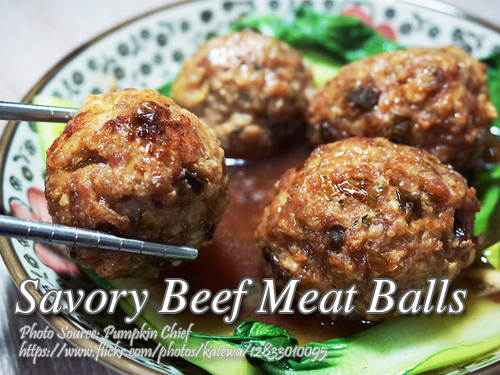 If you are looking for a something extra ordinary taste in meatballs, I suggest trying this savory beef meat balls. Made from ground beef, spices and extenders such as carrots and turnips then added with Parmesan cheese. This recipe also includes meat ball sauce to make your dish more appetizing. Too cook this meat balls dish; In a medium sized bowl, combine beef, salt and pepper. Add remaining ingredients and mix thoroughly. Shape 2 teaspoons of mixture into balls and arrange in a baking tray. Dip each mixture in beaten egg and roll in bread crumbs. Pan fry in hot oil until golden brown. Serve with warm sauce. To make the sauce, combine all the sauce ingredients listed above. Then simmer in a saucepan for 2 minutes or until the sauce thickens. To see the rest of the recipe with the exact measurement of ingredients, continue reading. In a medium sized bowl, combine beef, salt and pepper. Add remaining ingredients and mix thoroughly. Shape 2 teaspoons of mixture into balls and arrange in a baking tray. Dip each mixture in beaten egg and roll in bread crumbs. Pan fry in hot oil until golden brown. Serve with warm sauce. To make the sauce, combine all the sauce ingredients listed above. Then simmer in a saucepan for 2 minutes or until the sauce thickens. Salamat din sa iyo at sana patuloy ang pag-visit mo sa blog na ito. Thank po da sharing mo NG Recipe mo nkakatulong po it SA amin MABUHAY ka po Good Bless you more. Hi Esther, salamat din po.